Police didn’t arrest a lesbian girl’s adult attackers. Now her mom is stepping up. A teenager in Chicago was brutally attacked this past Tuesday, but police haven’t arrested any of the attackers. Now her mom is speaking out for her. Amari Graves, 15, was walking to a store in her West Side neighborhood when she was attacked by a classmate and several adults. “They all got out and walked up to me,” Amari said. She said that she recognized one of the people approaching her as another girl from her school, and the rest of the people were adults. Then they attacked her. “When I was walking she tried to pull a bat out and swing it at me,” she said. They pushed her to the ground and stomped and kicked her. One of the attackers sprayed mace in her face, and someone tore off some of her clothes. Her finger was bitten so badly it couldn’t be stitched back. The mother of one of the attackers was even recording the assault on her phone. While they beat her, they used anti-lesbian slurs. “They was calling me a dyke and a stud and stuff,” Amari said. 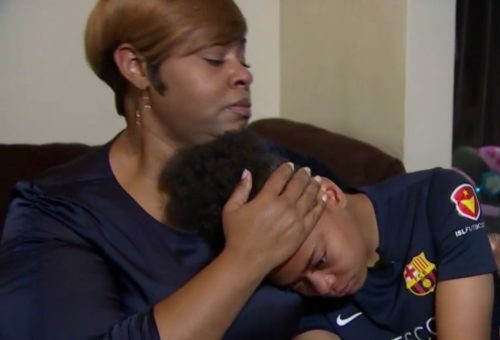 Amari’s mother, Catina Parks-Dorsey, believes that her daughter was attacked for being a lesbian, and she’s asking why the police didn’t arrest anyone when they responded to the attack. “Absolutely nothing was done,” Parks-Dorsey said. She said that it shouldn’t just be considered an assault, but a hate crime and sexual assault as well. Chicago police say they will present evidence to the prosecutor’s office for a decision on whether charges will be pressed.